The "Markazi Jamiat-E-Ahle Hadees" is an organization upon a mish-mash of confusion, remote from the clarity and distinction found in the usool of Sunnah and Salafiyyah. This is plainly evident when one looks at the writings, lectures and speeches of their contemporary figureheads, especially in India and Pakistan. 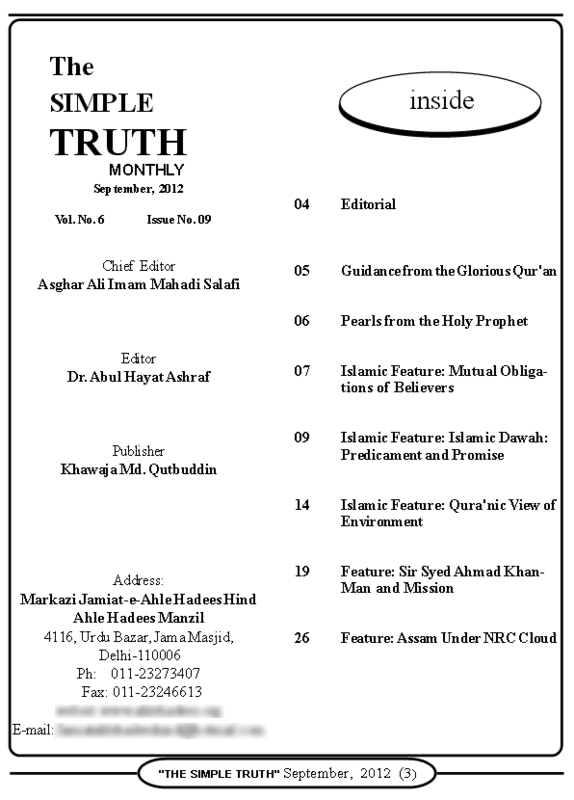 In this article we are simply going to highlight the nature of the problem in general through one illustrative example by which it is demonstrated that the leaders of todays "Markazi Jamiat-E-Ahle Hadees" do not distinguish between the Sunni and Bid'iyy - leaving that aside - they do not even recognize statements of kufr coming from individuals they consider as historical "figureheads," "leaders" or "representatives" of "Ahle Hadees"
Among those who were Ahle Hadeeths in India were Muhammad Bin Tughluq (1325-1351), Maulana Shams-al-Din ibn al_Haweri, Mualan Alam al-Din (grandson of Sheikh Baha al-Din Zakariyya of Multan), Shah Wali Allah (1702-1763), Maulana Abdul Aziz Muhaddith Dehlavi, Shah Muhammad Ismail Shaheed, Maulana Walayat Ali Azeem Abadi, Sir Syed Ahmad Khan (1817-1898), Nawab Muhammad Siddiq Hasan Khan (1832-1890), Shiekh Abdul Haqq Muhaddis of Benaras, Maulana Abul Kalam Azad (1888-1958) (Freedom fighter and first Education Minister of India) etc. Further, in their magazine published in September 2012 (screenshot), they included a glowing tribute to Sayyid Ahmad Khan spanning seven pages highlighting his contributions to society and the world. But who is Sayyid Ahmad Khan? He is a neo-Mu'tazili who tried to systematically demolish many of the symbols and foundations of Islam, attempting to forge a new type of Islam that does away with the Sunnah and in fact also does away with the Qur'an in essence, because he wanted to re-interpret the Qur'an to fit in with modernity, naturalism and scientism. Much has been written about this person and our intent here is just to summarize some of the main issues regarding him that are evident in numerous studies made of him. Sayyid Ahmad Khan (1817-1898) was a British-influenced thinker affected by notions of progress, civilization, rationalism and naturalism. He saw that adopting ways of the British was the way forward. 19th century British philosophy was a major reason why scientism (belief that science provides basis for truth and authority) brought about many hadeeth-rejecters and modernists from the Indian sub-continent. Sayyid Ahmad's students include Altaf Hussain Hali (1914) Sayyid Amir Ali (1928), Shibli Nu'mani (1914), and they cloaked Sayyid Ahmad's ideas in terms and forms that would appear less repugnant to Muslims. Sayyid Ahmad Khan reformulated Islam by equating it with British though, with its rationalism and scientism. His major doctrine was that the identity betweeen British philosophy and Islam was the ultimate judge of truth and broad re-interpretation of Islam. Sayyid Ahmad Khan wrote a tafsir called "Tahrir fi Usul al-Tafsir" which is a purely rationalistic interpretation of Islam. There was a large rejection of his ideas at the time which came from different segments of the society, including the Deobandis, various other Muslim organizations and even fellow-modernists. Sayyid Ahmad Khan believed wahy (revelation) to be synonymous with reason and natural law, being its highest form. He believed that the name "Jibreel" is simply a term used to refer to this "revelation" (i.e. highest and most perfect reason and natural law). He believed that prophethood is just a natural faculty and not a gift from Allaah and hence revelation is simply a natural phenomenon, just like other human faculties produce fruits then likewise prophethood is simply acquired through human faculties alone. He was a denier of miracles and the reality of magic. And he believed that the matters of the unseen mentioned in the Qur'an (Jinn, Angels, the Hereafter etc.) cannot be opposed to scientific reality and thus must be given re-interpretations within those known scientific realities. As a result he began to say that "angels" are simply the "properties" of created things like the hardness of stone, the fluidity of water and so on. And that "angel" also means divine moral support. That "Shaytan" refers to the dark passions of man and that the "Jinn" are projections of evil, disease and other calamities (and not actual beings), but in some instances may refer to wild men living in forests and deserts. His belief in Allaah was as deistic one (the world is sufficient evidence for Allah's existence but revelation is rejected as source and authority of religious knowledge - so Allaah, although creating the universe, is not concerned with it and does not send revelation and does not command or forbid and is simply uninterested in His creation, He is simply its primary cause and that is it). This led him to believe that prayer (du'a) cannot be heard. He was a rejector of canonical books of Hadeeth, and he claimed all traditions opposing reason are to be rejected. Sayyid Ahmad Khan's rejection of hadeeth and likewise his students some of whom were more extreme in this rejection foreshadowed the opinions of Jewish Orientalists such as Joseph Schacht and Ignaz Goldhizer who claim that the ahaadeeth were later fabrications. As a result Sayyid Ahmad Khan set in motion a trend of doubting and rejecting many aspects of Islamic law, principles of fiqh, ijmaa' (consensus) and qiyas (analogy) - all of which followed on from the hadeeth. 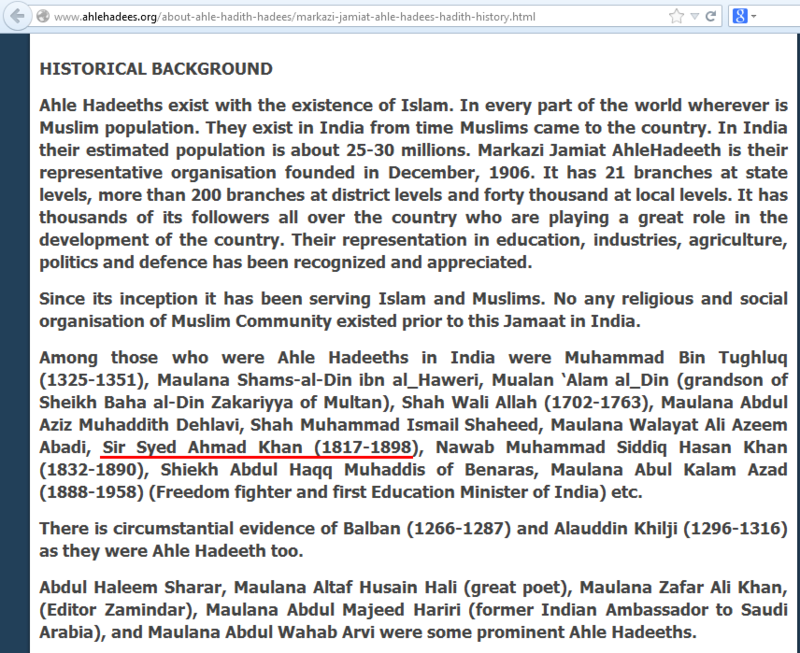 The Markazi Jamiat-E-Ahle Hadees Hind is a deviant, astray organization which actually hinders people from arriving at the creed, way, methodology and usool of the true "Ahl al-Hadeeth," the As-haab al-Hadeeth, the Ahl al-Athar, all synonymous terms for one faction, those who are upon what the Companions were upon in the era of Prophethood, who are united upon the their aqidah and manhaj and whose methodology and da'wah and walaa and baraa' is based around it. The Markaz often makes attachment to the "Salaf" and may sometimes use the word "Salafi" but this is a spurious attachment and indeed a great lie and injustice. This Jam'iyyah is far removed from Salafiyyah as anyone with an ounce of honesty and sincerity will acknowledge. For how can this Jam'iyyah praise and aggrandize a man such as Sayyid Ahmad Khan, and include him amongst the generality of the "Ahle Hadeeth or the Salafis" (as they say on their web page)?! In essence, the Markaz does not make tamyeez (distinction) and thus also has corruption in walaa and baraa' and this is also the disease of al-Ikhwan al-Muslimeen of Hassan al-Banna which is founded upon this principle. And this also explains the nature of the da'wah of this Jam'iyyah in that it is a da'wah founded upon absence of tamyeez and separating truth from falsehood, the Sunni from the Bid'iyy and subsequently knowing where to put its allegiance and loyalty.